Dwayne “the Rock” Johnson knew every single word of Taylor Swift’s “Shake It Off”—which is saying a lot, considering the Rock’s whole persona. As a onetime wrestler and now movie star, he is the antithesis of the young woman’s anthem. But that didn’t stop the Rock during his lip-synching battle on the premiere of Lip Sync Battle between himself and host Jimmy Fallon. 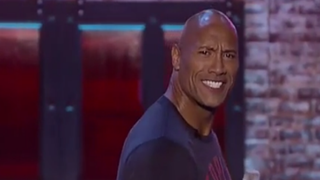 The Rock owned the stage, placing the right emphasis on certain words and knowing exactly what facial expressions should be used during certain parts of the pop single. But what perhaps made the Rock’s rendition so hilarious was his muscular frame, which protruded from his T-shirt as he lip-synched. LL Cool J and Jimmy Fallon looked blown away while they watched the spectacle from the side of the stage.